If there was a Mount Rushmore for adventure motorcycle riders, Helge Pedersen would be the first bust sculpted. 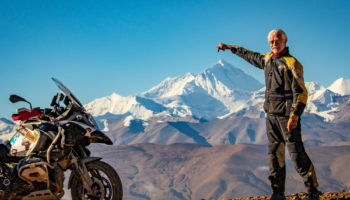 He literally wrote the book on touring the back roads of the planet on a two-wheels when he published ’10 Years on 2 Wheels’. His book has inspired an entire generation of riders. Helge continues to tour the world with his Globeriders team and at Touratech we’re lucky to be able to pick his brain on occasion. He’s been bolting Touratech products onto his bikes for many years and, like Touratech-USA he calls the Pacific Northwest home. At this year’s Touratech Rally West, we asked Helge to discuss the newest generation of Zega Pro Panniers. If anybody know the importance of great luggage, it’s Helge Pedersen. Not only does he discuss the boxes, but also some of the cool accessories for them.